Pay less for your camera phone without compromising on quality. You'll find a superb bargain snapper with this guide. Despite the remarkable choice of mobile phones out there (or, indeed, because of the range) it remains a tricky task to balance high quality with a reasonable cost. No phone feature more demonstrates this than a smartphone’s camera. Which is why we’ve written this guide to the best camera phone you can buy on a budget. Even defining 'budget camera phones' is difficult. One person's 'affordable' is another's "how much!?". 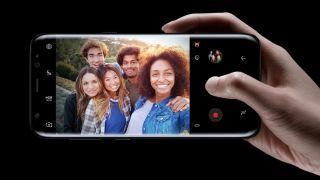 So although you won't find any iPhone XS or Galaxy Note 9s on this list, you will still find the best budget camera phones from the likes of Apple and Samsung costing up to around $400/£400. Still sounding a bit on the pricey side? No worries...we've also recommended smartphones that are much cheaper than that without compromising too much on camera quality. With the cheapest on this list coming in at less than $200/£200. With the key specs and our clear reasons why we've included each entrant on our list, by the time you get to the bottom of our best budget camera phones guide you'll be in no doubt which model to buy. When Samsung releases new phones, the old flagship models don't get forgotten about - they just become fantastic affordable phones. That's exactly what has happened to 2017's Samsung Galaxy S8. First and foremost, the consistency of the quick automatic main camera never ceases to be impressive. Point and click was never so easy. But above and beyond the normal, Samsung brought in a remarkable host of features and settings to the S8, including a brilliant selfie mode. And, not to be underestimated, the Galaxy S8 is the ideal shape and size in the hand to use for photography. Considering how little you have to pay for the Wileyfox Swift 2 Plus, it's scarcely believable how good the main camera on it is. The troubled Wileyfox brand may not be a household name, but this handset gives you a 16MP camera and a 3L8 sensor courtesy of a manufacturer that you just might have heard of - Samsung. That means that you can forget the grainy, washed out snaps that you may expect from a phone of this price and look forward to rich colours and fine detail. Even the autofocus holds its own. Of course it isn't jam-packed with features and it's a bokeh-free zone. But...well did you see the price? Look around the web and you'll see the Moto G6 crop up again and again at the top of best budget smartphone lists. Combining excellent quality across the board (display, battery, design), it's easy to see why. And the cameras are a big contributory factor, too. It starts things off with a dual main camera set-up on the rear. The 12MP and 5MP sensors team up to enable the auto mode to take consistently attractive snaps. The portrait mode is surprisingly effective and even the 8MP selfie snapper on the front isn't bad. So while we just about prefer the main camera on the Wileyfox, the Moto G6 is the one to go for if you have a bit of extra cash and want a better phone on the whole. Yes, you can buy an iPhone on a budget. It's true. You just have to look back through the annuls of their releases to find one cheap enough. The iPhone 6S was one of the very best cameras on the market when it hit the shelves in 2015, and that included the camera. It introduced Live Photo, made more of the then-innovative 3D Touch and raised the megapixel count on the main snapper to 12MP - resulting in the most detailed images any iPhone had captured at the time. Want to save some more pennies? Then the iPhone 6 camera isn't that much worse, although the megapixel count goes down. Sony has a notable dynasty in photography and so it's no surprise to see it coming up with the goods on the wallet-friendly Sony Xperia XA1. On specs alone, the rear camera has a similar look to dedicated standalone compact cameras with a 23MP sensor of 1/2.3-inch size. On a day-to-day basis that means generally fabulous looking photos. It even succeeds in darker climes, with Sony's brightening smarts achieving excellent quality. Things start getting a bit rough around the edges on extreme close ups, but this is a cracker of a snapper for the price. Honor is increasingly staking a claim as the posterboy for how to build smartphones on a budget. The Honor 9 Lite is a fine example. Mobiles don't come much more affordable and yet you still get dual rear-facing cameras and dual front-facing cameras packed into a design that's based on the former flagship Honor 9. So if you just need a device that's going to deliver passable photos in good conditions (don't expect too much in low-light), then you can't get much more affordable than the 9 Lite. The camera in Sony's XZ Premium had already won us over, and then they went and put it in its 2017 flagship Xperia XZ1. So that means super defined 4K video shooting from what we can now call a budget handset - practically unheard of. There may not be the same resolution in the 5.2-inch display, but you can still enjoy most of the splendour of your footage in HDR-supported quality. And 4K isn't the only trick up the XZ1's sleeve, as we also really admire the super slow-mo smarts that captures 960fps. You really can achieve a lot with this Sony smartphone. 2018 was such a break out year for Huawei that we know that it's now a name well set in the public consciousness. And it wasn't just at the very top end of the market that it impressed, with the Huawei Mate 20 Lite showing what can be achieved with a $300/£300 phone. With a 6.3-inch screen, it's larger than most of the other smartphones on this list (you've entered phablet territory, really). And check out the specs of the cameras - there's a reliable 20MP and 2MP set-up on the rear for photos that pop with color, and 24MP and 2MP on the front for excellent selfies that even let you achieve that sought after bokeh effect.